November 17, 2015 – How do you reduce the weight of a spacecraft’s underlying structure, while using the same materials as the heavier version and still hold to the same manufacturing schedule? This month, the engineers who helped answer that question are seeing their hard work pay off. Technicians have finished welding together three cone panels that make up a section of the Orion crew module that will fly beyond the moon on Exploration Mission-1 (EM-1). Orion’s pressure vessel is composed of seven large pieces of aluminum, three of which are the cone panels. The pressure vessel holds the atmosphere astronauts will breathe against the vacuum of deep space, forming the crew compartment. The three panels together form the angled mid-section around the crew module where the windows and hatch are located. While technicians have been joining other elements of the structure together since early September, the cone panels have presented a unique challenge for NASA and Lockheed Martin, the agency’s prime contractor for Orion. Engineers who have sought to reduce the crew module’s overall weight have encountered and overcome technical challenges. When the test version of Orion’s underlying structure was first constructed, it was heavy. The original conical section was made of six panels and six longerons (thin strips of metal) that required 12 welds to bind them together. Manufacturing the panels took considerable time. The welds also added considerable weight to ensure the seams were strong enough. As engineers refined Orion’s design, building on lessons learned from constructing the initial test article and capsule for EFT-1, followed by diligent analysis and iterative design evaluations, engineers found ways to reduce the number of cone panels and welds, resulting in a needed weight reduction for EM-1. But reducing the structure’s number of cone panels has required considerable resourcefulness and skill on the part of Orion’s engineering team. When technicians began manufacturing the three new cone panels for EM-1, each comprising one-third of the circumference of the crew compartment and each made from a single piece of metal, they encountered an issue during the machining process. The large, curved panels had a tendency to flatten out or relax more than expected. 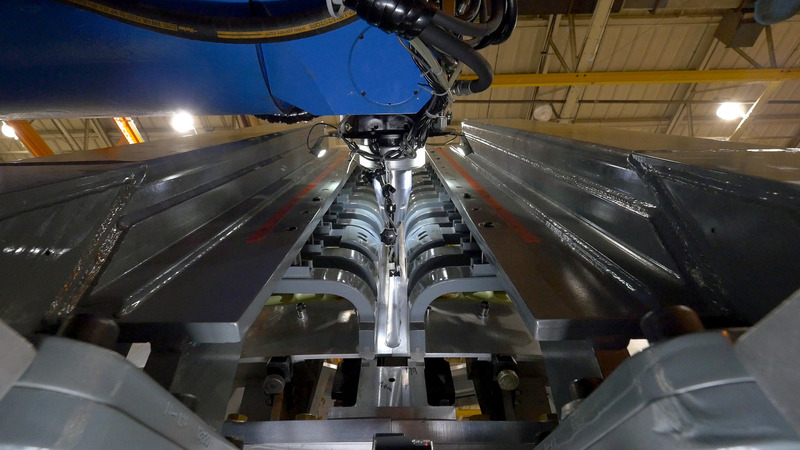 The Orion team knew the relaxation of the panels posed a threat to the manufacturing process and to Orion’s schedule, so they developed a new plan to keep the process on track. Engineers first standardized the technical steps to make the pieces to exact specifications and divided manufacturing of the three panels among three different expert machining companies. The revised plan enabled unprecedented collaboration across the industry while working on all three panels in parallel, ultimately saving time. Engineers had to redefine the specific conditions under which welding operations must occur. These included the temperature and humidity in the room, the rotational speed of the weld head and how quickly it moves to join two pieces of metal. 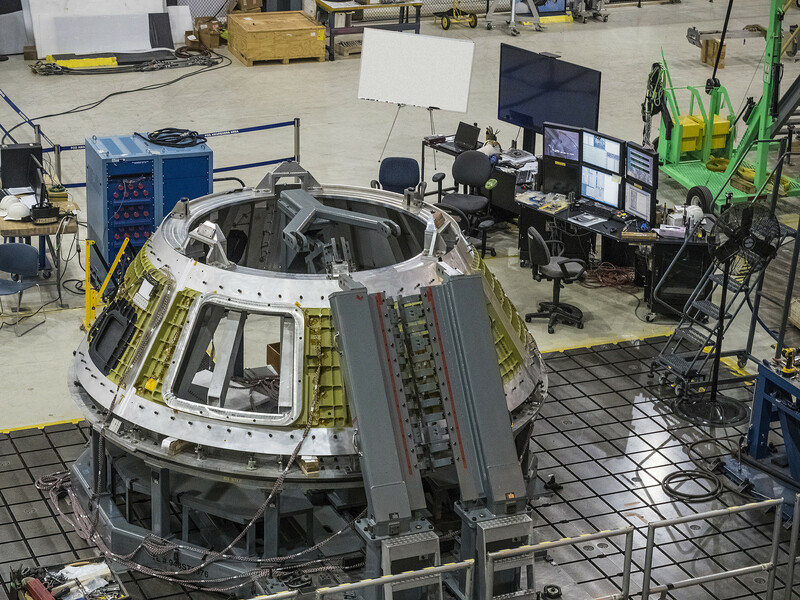 This revised cone panel process isn’t the only weight-saving measure being incorporated into future Orion Crew Modules. Besides the reduced number of pieces and welds making up the pressure vessel, Orion’s thermal protection system, which protects the spacecraft during its extremely hot and fast reentry through Earth’s atmosphere, will be approximately 1,200 pounds lighter during EM-1 than it was during its maiden voyage to space. When completed, the crew module will be approximately 20 percent (4,000 pounds) lighter than it was during EFT-1. Technicians will perform two final welds to integrate the other elements of the primary structure. After completion, it will be shipped to NASA’s Kennedy Space Center in Florida, where it will be outfitted and processed in preparation for its launch atop the agency’s Space Launch System (SLS) rocket. Boosted by the power of the SLS rocket, Orion will travel farther into deep space than a spacecraft built to carry humans has ever been.